This evening I learned of the death of a fellow Blog Buddy and writer extraordinaire Neptunus Lex (Captain, Carroll LaFon USN(Ret.)). My words this evening I’m sure will not come easy, which is somewhat ironic considering that for Lex the opposite always appeared to be the case. I first started reading Neptunus Lex some nine years ago now, back in the early days of the Blogosphere… There were fewer of us then and his prose stood out as something to take note. He used polysyllabic words in proper context and could offer up a Latin phrase without consulting wikipedia! Truly a renaissance man, his blog became a regular daily read for me and… as the years advanced, for literally thousands of others. I first found myself drawn to his Blog due to his fantastic yarns of Naval Aviation daring do known as Rhythms. It wasn’t so much the plot, as I have heard many a similar tale over the years, but more in the way he spun the words. Rather than bringing the story to you, he brought you to the story. It is said that a picture is worth a thousand words, yet Lex could create a picture in far fewer. Lex’s writings were not solely dedicated to Naval Aviation, no… as I said Lex was truly a renaissance man, he shared with us philosophic insight few scholars can match. He had a way about him to boil down what many of us were thinking about an issue but we lacked the vocabulary or literary dexterity to convey properly in prose. Lex nailed it time and time again! One of my favorite posts of his was on “Belief” and exactly what he believed in… http://www.neptunuslex.com/2003/10/22/beliefs/. I walked away from that post concurring with… well hell… All of it! Wishing I could learn to write well and assemble my thoughts a little more productively. Another perhaps a proper legacy is Lex’s account of Ulysses… the hyperlinks are important. I will miss him. I know I will catch myself looking wantonly at my links in the left pane here of Carmichael’s Position looking for Lex’s next post… knowing grudgingly it will never come. I will resign myself to reading his archives once again, enjoying his legacy, his advice, and his turn of a phrase. My prayers are surely with, The Hobbit, Son Number One, The Biscuit, and Kat. His family… and thanks to his words… ours too! We have always been here for Lex, now we are here for you! God Bless… And thank you for sharing him with us all these years, you are not alone in your grief! On days when Lex did not have the time to publish profound works of art, he was always kind enough inform us that his posting would be sparse for the time being. He often would throw us a bone in the form of a controversial news link and then allow us all to voice our commentary in his comments section. His final words would be “Talk Amongst Yourselves” as he proceeded to carry on with his life. Now we are left to only… talk amongst ourselves, but you know he’ll be following the threads. Thank you Lex… Here’s to you, and those like you… damn few left! Went to the Rocky Mountain Metropolitan Airport (formerly Jeffco) open house and airshow today. It afforded me the opportunity to exercise the new Nikon D7000 for a few 100 rounds. 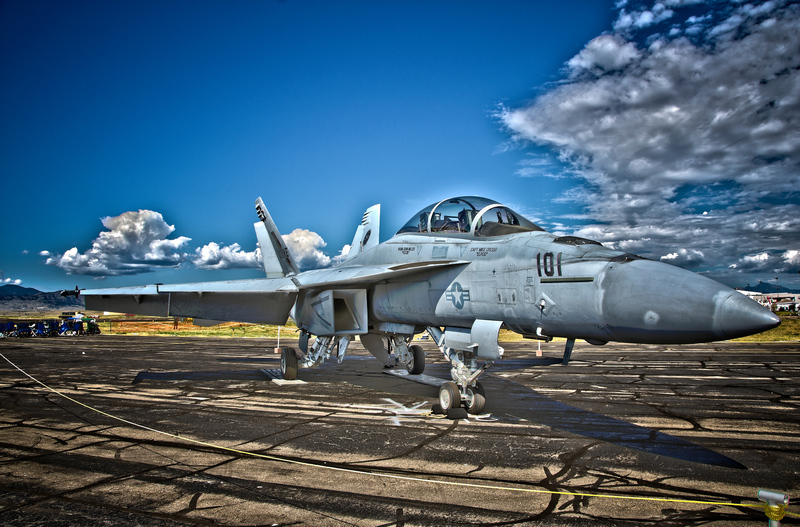 And then, so far my only HDR to turn out well (again no tripod and holding the camera perfectly aligned for three exposures is a bit of a booger)… I give you the Surreal Super Hornet! But at least the outcome is the right one… In my mind. The 24-year-old Perrysburg, Ohio, man was tried at Naval Station Norfolk on accusations of assaulting Ahmed Hashim Abed, who is suspected of plotting the 2004 slayings of four U.S. contractors in Fallujah. The prosecution's key witness had testified he saw McCabe deliver a right cross to Abed's midsection. However, several defense witnesses contradicted portions of that testimony. A Navy prosecutor said in closing arguments that SEALs were trying to protect one of their own. "They circled the wagons," said Lt. Cmdr. Jason Grover. "They don't want Petty Officer McCabe to be held responsible for this." A defense lawyer said he found that suggestion offensive. “SEALS trying to protect their own…" You don’t think that’s because the NAVY and the Nation they’ve sworn service to was not… do you? Hoooo Yaaaa snake eaters! As you all know, your enemies are not always in front of you. Dawn broke on Friday, and I found myself back in my favorite places, San Diego. Ginger and I are here for a special dedication of an A-6A on board the USS Midway by the Squadron Members of VA-115 “Arabs” in the name of Mike McCormick and Alan Clark, the last two Intruder Aviators killed in action during the Vietnam War. For as solemn of an event as this sounds, it certainly affords all of the squadron mates of 115 to rejoin from the corners of the nation for a great time of comrade and remembrance. This is a great group of folks! Loving, caring, supportive, fun! And the stories to hear! I’ll be posting more on the dedication over at Tailhook this week. So keep your eyes there as well for the details. As for the rest of this weekend, Ginger and I are playing tourist! Between obligations yesterday, Ginger and I headed to probably one of the best seafood places in San Diego… Point Loma Seafood, for a great serving of Swordfish Tacos and a fresh Alaskan Halibut sandwich… mmmm… mmmmm. Gin had some school work to finish up (no rest for the Master’s student), so I took the opportunity to walk a few miles along the embarcadero looking for a few photo ops. Snapped a few that I’ll be sure to post shortly. Last evening we were invited to rejoin the Arabs, for a cocktail gathering at the Se San Diego. Again an incredible get together to share stories, jokes, remembrances. Just being allowed to interlope among these heroic individuals is a privilege I do not take lightly. Today, we’re off to the Zoo. Even having lived here for a great portion of my life, I visited the zoo rarely, and the last time I was there was probably 25+ years ago, so I’m looking forward to that. Duke Cunningham Went to Jail for this Stuff! Really… can’t make this sh!t up… who’d believe me? More on Duke for those interested. Cunningham resigned from the House on November 28, 2005, after pleading guilty to accepting at least $2.4 million in bribes and underreporting his income for 2004. He pleaded guilty to federal charges of conspiracy to commit bribery, mail fraud, wire fraud and tax evasion. On March 3, 2006, he received a sentence of eight years and four months in prison and an order to pay $1.8 million in restitution.